I went back and forth this week on which photo to use. There were some portraits which I loved, a shot of her in a busy kitchen with her grandpa, and this. 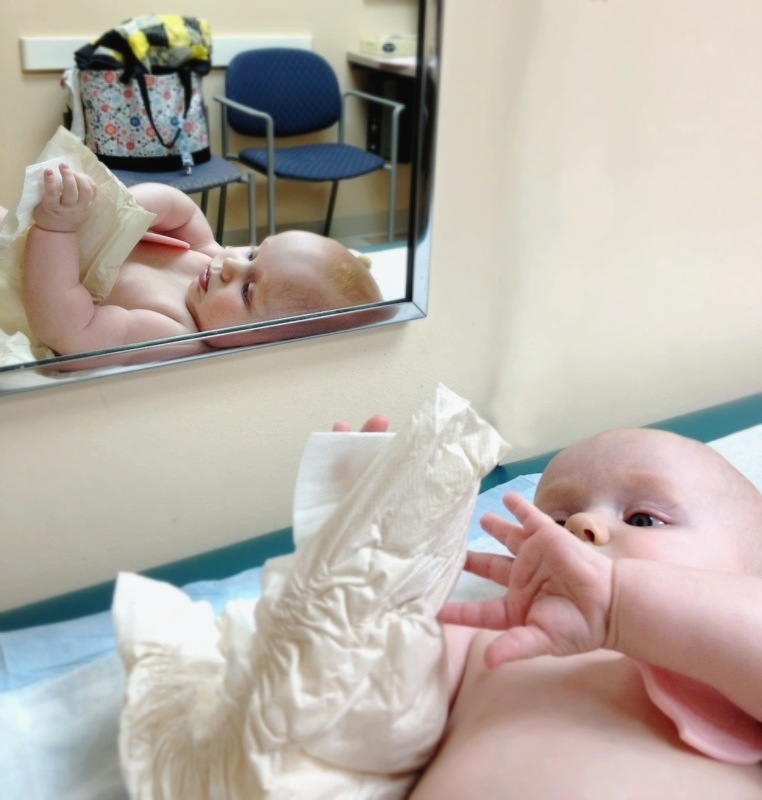 Shot on my iPhone, in the doctors office before she got 4 shots. I hesitated to use this photo, low quality, hastily taken while trying to entertain her. But I kept coming back to it. We’ve spent a lot of time in doctors offices, her and I and this photo just felt right this week. I love how it feels like she’s two different babies in this. She had a rough week this week and she kind of was two different babies. The happy giggly girl with me, and the cranky fussy pants with everyone else. It may have been the shots, or maybe she’s teething, or had a cold, or adjusting to my new schedule. Who knows. She’s been great the past few days so here’s hoping its passed. My favorite from last week comes from James at bleubird. I love the photo of Milla Plum and her pug. I so hope that’s my babe with her puggle someday. 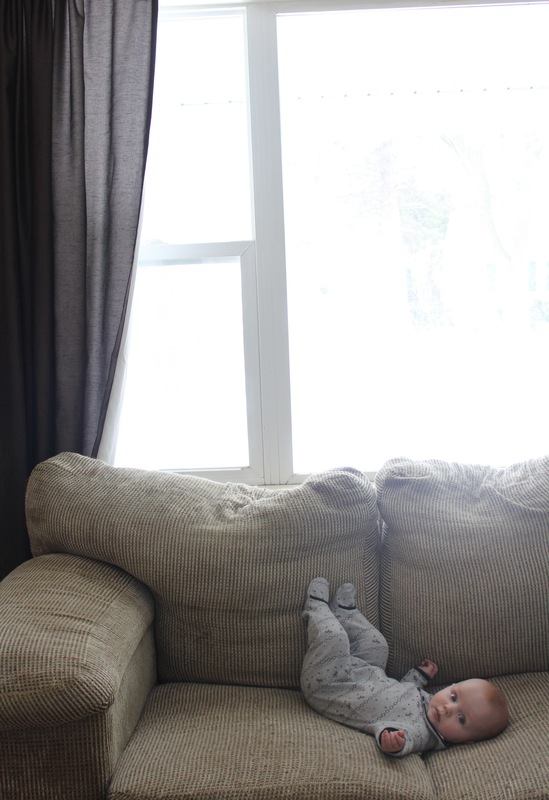 To say that I’m struggling to adjust to being a working mom would be an understatement. 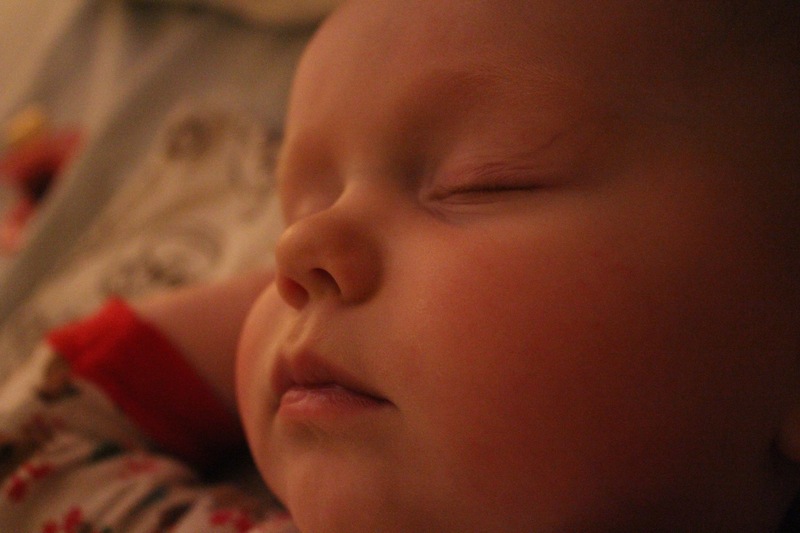 Leaving my baby to work was something I began to dread from the moment I met her. Then she became so attached that being apart was painful for us both. The day came, and I went to work, and she surprised us all. She did so well without me. I was so proud and even a little hurt. She figured it out, just in time. This week everything I was worried about has been happening. She’s been screaming and melting down while I’m gone. Last night when I got into the car after I was done at work she was inconsolable. We drove home as quickly as possible where I nursed her and she immediately relaxed. These past few days she’s not eating or sleeping while I’m gone. My mother thinks her legs are sore from the shots she received on Monday, my husband thinks she has a cold. Maybe it’s all the avocado changing her digestion. Or maybe she’s teething. Or waiting until I get off of work at 7:30 is simply too late for her to be awake. The part that kills me is she’s fine when I’m home. Better then fine, happy, naps perfectly, giggly perfect baby. Then by the time I get home she’s so overtired and exhausted it takes almost 2 hours for me to get her to sleep. This momma is seriously hoping this passes quick or else being poor sounds like a much better option. I haven’t been cooking. I haven’t been baking. Last night I desperately wanted some cookies or a cocktail, and having neither in the house, I settled for a spoonful of peanut butter and some chocolate chips. I spend the first half of my day determined to make her as happy as possible in hopes that her afternoon and evening goes well. I’m starting to think I need a new plan of attack. This morning I was determined to eat something substantial for breakfast. But I also didn’t want to take time away from my babe. So I went with baked oatmeal. Throw it in a ramekin and set a timer. Super simple, super comforting, super filling. I threw strawberries in mine, but you could pick any fruit you like. I like to add just a tiny bit of cream to mine when it’s done baking. I love the way it softens everything up and the creamy hint it adds in the background. 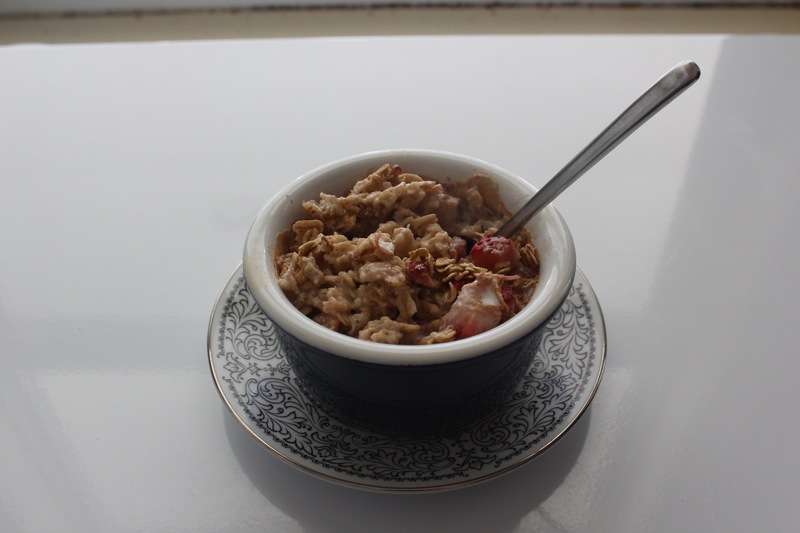 The cooked oatmeal stores perfectly and can easily be reheated. 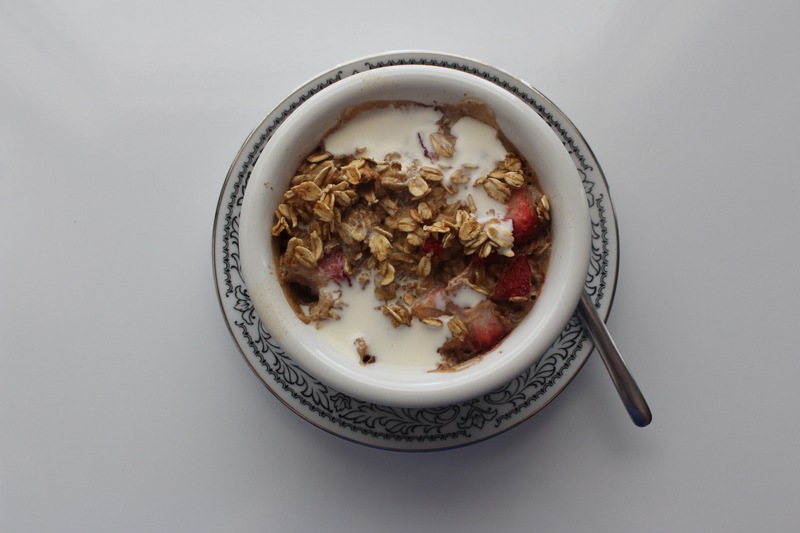 It’s the kind of breakfast that makes you feel like you can tackle your day, hearty and comforting, but not heavy. You could easily make this on a Sunday and freeze a couple for the week. For overwhelmed moms in all scenarios it’s a life saving breakfast. 1. Preheat oven to 350 degrees. Mix all ingredients except for cream in a medium bowl. Divide among 4 ramekins and bake for 20 minutes. 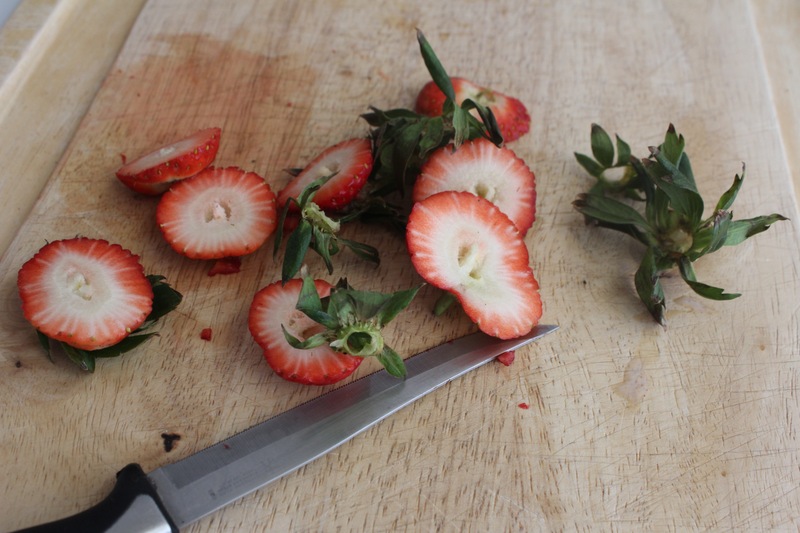 Cool for 5-10 minutes before serving, serve with cream and more fresh strawberries. 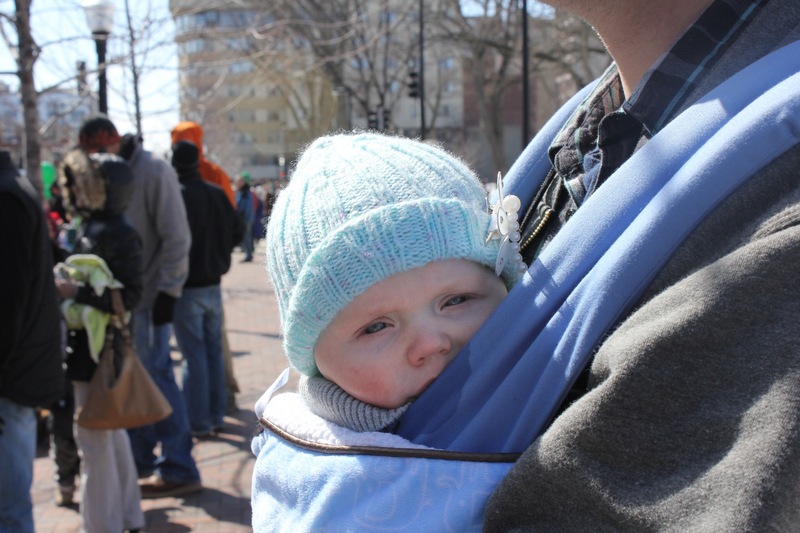 This week began with St. Patricks day and our first venture into a large crowd with our babe. You see, all winter long we’ve kept her hidden away, to protect her from germs that could potentially harm her special heart. Each month she’s received a synagis shot, to enable her body to fight RSV if she were to contract it. Well she had her last shot this week, so it seems the medical community deems the majority of the risk over come April. So we’re beginning to take her out into the world. I’m hoping swimming lessons are in our future, introducing her to extended family and less worry will follow. We will however, still be avoiding sick people like the plague. We started off this week at the St Patrick’s day parade. Her grandparents were in it and we wanted to have somewhere to take her all dressed up in green. She was amazing. Wrapped snugly on mine or her papas chest, she was happy and content all day. Even a trip into a packed-to-the-max Starbucks only produced giggles and squeals of delight. I could not have been more proud. I took this photo while we were watching the parade. Her pink little cheeks, the only thing that got cold while we were out. I loved seeing her out in the world, taking it all in, unafraid while safely strapped to her papas belly. My favorite this week comes from lamblovesfox. It’s a beautiful little series. I want to live in Maine. In a house on the coast, with dark wood everywhere. Right on the water, where the wind in the winter howls outside and everyone huddles under blankets while they snuggle on the couch. And there’s an old wood stove in the middle of the living room, and built in book shelves and bunk beds in the babies room. Outside are maple trees where we tap our own syrup(do they do that in Maine?) and in the summer there are rows and rows of blueberries. And our babe runs free on the beach in the summer sun, while we eat lobster rolls(wait, I’ve never even had lobster) and drink wine. We get up with the sun to drive into town where we run a small bakery, making loaves of rustic bread and sweets for the fishermen and tourists. Our days are long, but filled with bliss. Ok so maybe not Maine, I do love Wisconsin so, but everything else about that little dream sounds lovely. This time of year I tend to find my mind running wild with dreams like this. I think it’s the impending spring time, which in a way I sort of loathe. The melting brown dirty snow, that takes soooo long to disappear, the mud that seems to linger everywhere, and the temperatures that hint, it’s time to play outside, but not just yet. So I make myself baked goods that take me somewhere else. Usually involving strawberries. This year I made a coffee cake. It’s so much more then just a coffee cake. 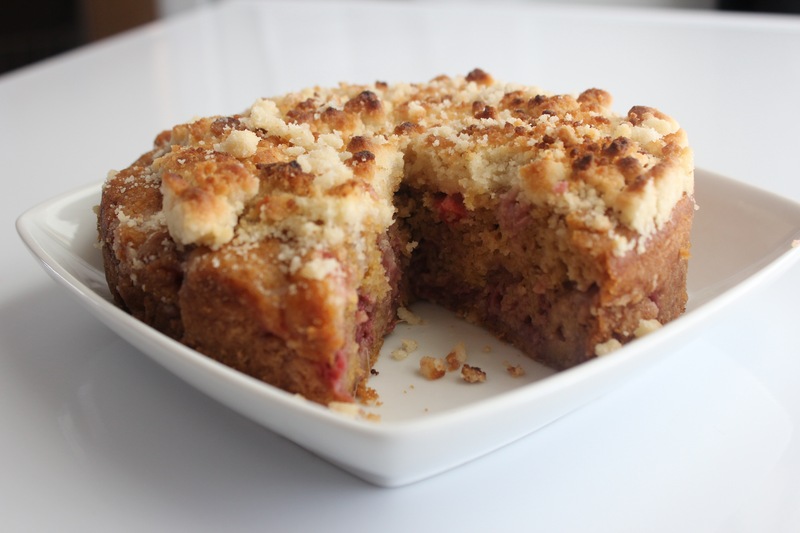 It’s a strawberry brown butter cream coffee cake. And it’s remotely healthy! 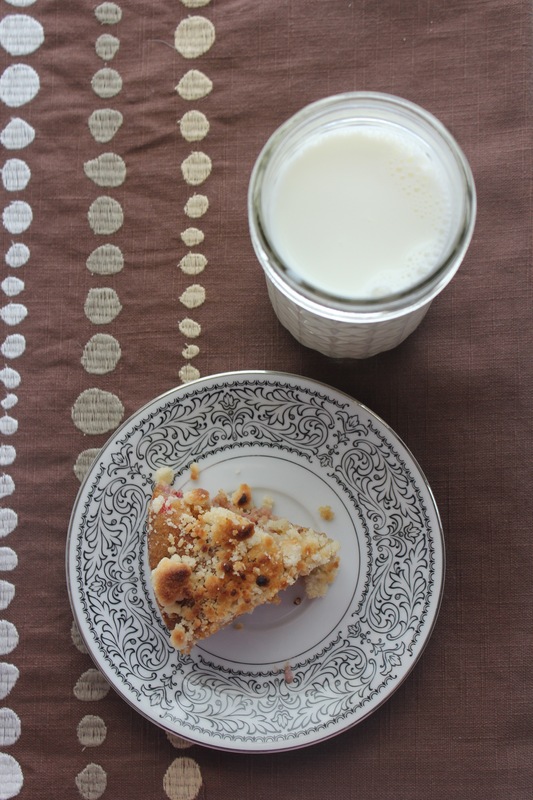 I took the idea of a soft coffee cake, with crumbly topping and tres leches cake and came of with this. It’s low in sugar and made with white whole wheat flour, so the cake it self has an almost salty bite. It’s bursting with strawberries and lush and moist from the cream. It may not be a house in Maine, but it’s a lovely reminder of spring time on a freezing Wisconsin morning. A note on this recipe: if you would like a slightly sweeter cake add 1/4 to 1/2 cup sugar to the butter before mixing with the milk and eggs. 1. Preheat oven to 350 degrees. Grease a small cake or loaf pan. In a small saucepan, heat the butter over medium heat. Butter will begin to bubble and foam, and spit. Brown flecks will begin to appear, once the bottom of the pan is covered in specks and the butter is golden in color, remove from heat. Scape the bottom on the pan, and transfer butter to a glass to cool. 2. In a medium bowl combine flour, baking power, baking soda and salt. In another bowl combine milk, egg and yolk, vanilla and honey. Add the melted butter to the milk. 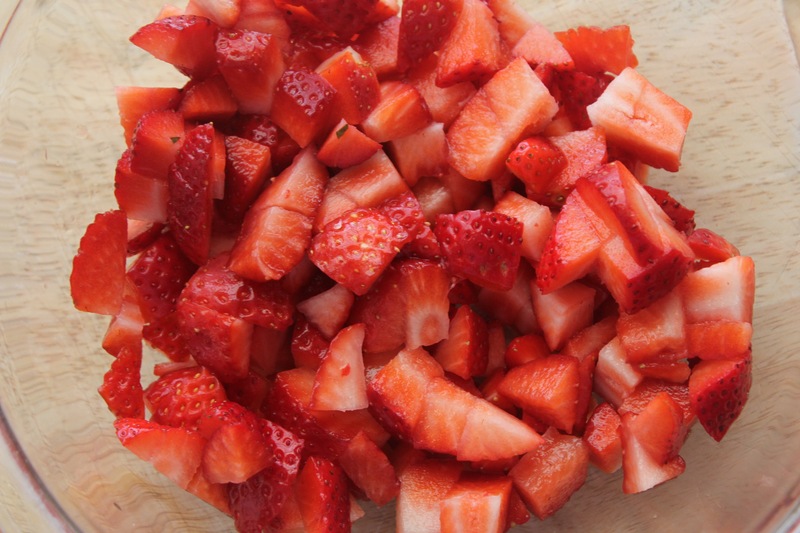 Mix dry ingredients with wet and add strawberries. Bake for approximately 30 minutes, until a toothpick inserted comes out clean. 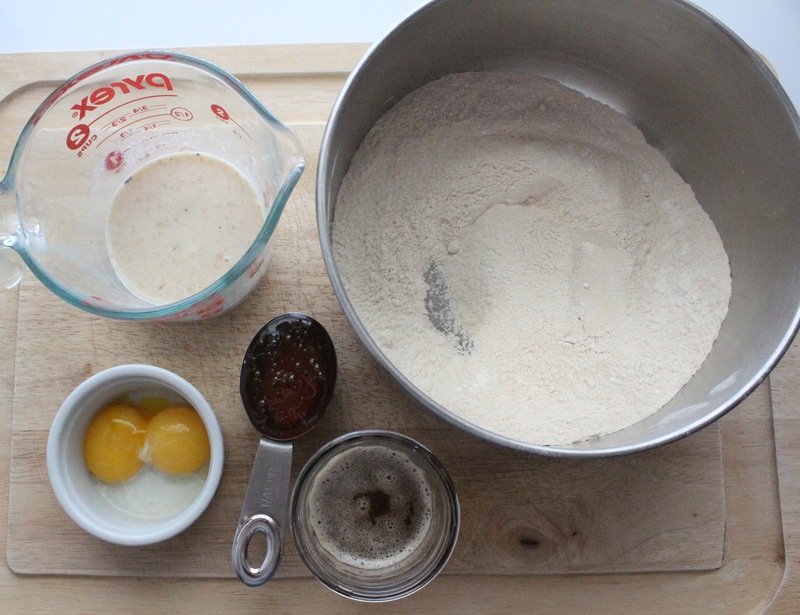 Make topping: combine butter, sugar and flour until mixture is crumbly. Remove cake from oven. Using a small wooden skewer poke numerous holes in surface of cake, pour cream over cake. Cover with crumb topping. Bake for 10 minutes. Turn on broil for 1 minute to brown topping. Cool completely before removing from pan. This week has been filled with frustration, kitchen failures and not enough time. I can’t imagine what going back to work full time would have been like, part time is hard enough for me. Each day I desperately want to just stay home, but I do as I’m supposed to and keep going back. This child has stolen my heart. More and more each day. Being away from her every day has made me almost crazed to spend time with her. She has become so dependent on me that other mothers might be irritated if they were in my shoes. She wasn’t always this way, in fact when we first brought her home, she was so independent, almost fiercely so. 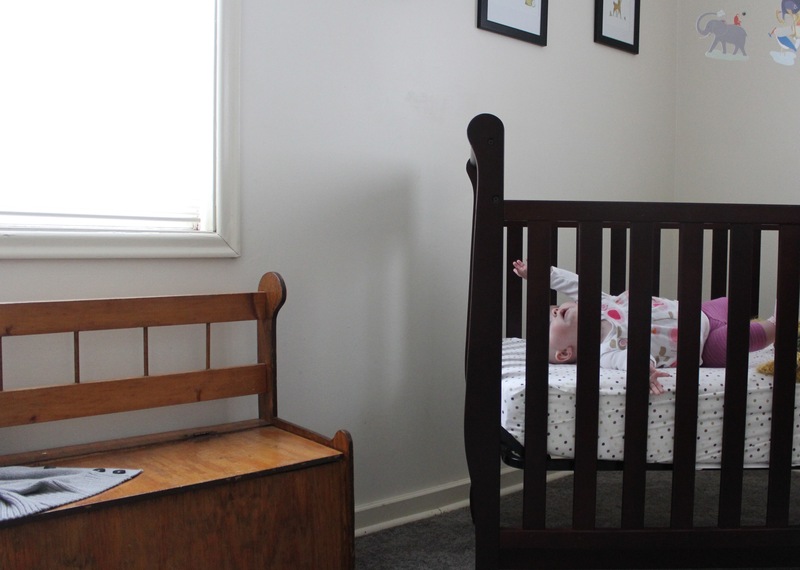 She liked to sleep in her own little bed, to fall asleep on her own, and to simply be, without too much interference from us. I chalked it up to spending weeks in that hospital bed, unable to be held at first, and learning how to self soothe. I think all of the holding, and cuddling I did upon bringing her home was a bit more for me then her. And now she needs to be cuddled to sleep, she refuses to stay asleep unless I’m near, and she wants to be held as much as possible. It does make bedtime a long process, usually resulting in me going to bed earlier then I planned, but seeing how she reaches out and clings on to me in her sleep makes it impossible to mind. She will be six months old this week. Half of a year. It seems so long and so short at the same time. I can’t remember what life was like before her, yet it seems like just yesterday she was a tiny floppy newborn. Again, I love the light in this photo. I’ve always been partial to the afternoon light that streams through a window on an overcast day. I noticed while playing on the couch with her how much bigger she’s gotten, yet how she’s still so small. That relative size startles me at times, as I don’t always notice how quickly she’s grown. And that red hair. My little ginger baby. I love that tiny dusting of red hair on her head that grows ever so slowly. This week I loved the portraits on petitebiet. Especially the expression of a new big sister with her tiny baby brother next to her. Next week will be 12 weeks into 2013 already. That’s only 40 left. I promise to throw some recipes in here occasionally once I get my routine down again. These days I’ve just been burning sugar, and making bad ice cream. Sooner or later I’ll make something good. Ok so it’s not number 10. I’m actually just joining this venture. 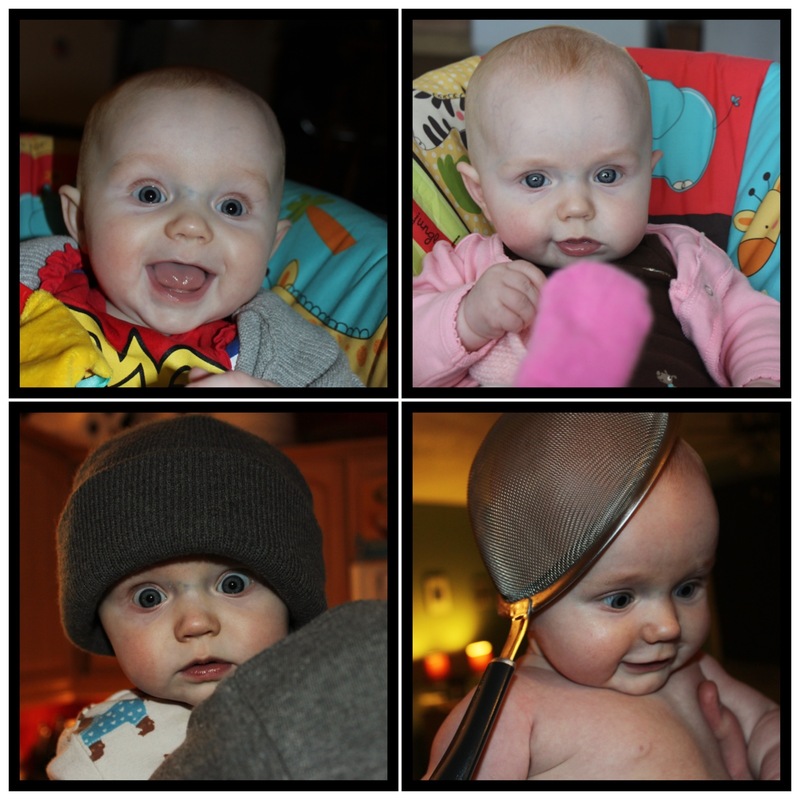 But come on, who are we kidding I’ve taken hundreds of photos of this child in 2013. But here’s the kick, how many of them can I actually say we’re portraits? So I’m going to be part of the 52 project. It’s a beautiful, amazing protect. So here we are 10 weeks in to 2013. And what a week it’s been for me. I stopped and caught this moment while getting ready for work. Going to work has been extremely difficult for me. The grace in her gesture in this photo is what gets me. It’s a subtle moment amidst chaos in my own brain. The sweater thrown on the bench, forgotten about days ago. The soft light coming through the blinds. This photo makes me catch my breath, and I’m not even sure why. But I love it. Click on some links from this project, discover new blogs. They’re gorgeous. My favorite this week goes to This Whole Family. I love the feet. And the cut paper. So simple and beautiful. Well it’s Friday, and now just like the rest of the world, that means the weekend for me. This tiny maniac faired quite well this week. Can you tell? And yes, that’s a mesh strainer. On her head. She’s back to loving her grandparents, is getting better at taking a bottle, and slowly adjusting her sleep schedule. My meals have consisted of pizza, Mac and cheese, leftover Mexican, and cafeteria food. Thankfully I had a half day, and whipped up some banana bread in 10 minutes while my babe happily bounced away in her jumper. Hopefully this weekend I will be back with more recipes! Until then I leave you with my banana bread recipe. I went back to work today. I’m lucky that I was able to spend 5 months home with my baby. But it still wasn’t long enough. I would happily be a stay at home wife and mother for the rest of my life, cooking and baking, cleaning and taking care of my family. I feel like a minority these days. Like I am somehow different then the women my age. Hearing women complain about motherhood. Moaning about sleepless nights, begging for a night away. Hearing “just wait…” Or “good luck..” Dripped with sarcasm. It has somehow become the norm to resent your baby, mourn your independence and even at times wish you never had that child. I simply don’t get it. Is it because of everything we went through to get where we are? To almost loose her when we just met her? Because we planned for her for an entire year before she was conceived? Because we waited until we were 30 to do this whole parenting thing? I can whole heartedly say I love being a mother. I don’t miss anything about my former life. I remember always feeling like I was searching for something before she came along. Like something was missing. I thought it was a career, a job with purpose and meaning. But it turns out it wasn’t. All along it was her. I look at her and wonder what I did before she came along. I think I watched waaaayy too much tv. I will admit accomplishing anything is a bit more difficult with a baby. But I seem to be able to balance it, and each day it gets easier to do so. I’ve been cooking and baking as much as ever lately. The week leading up to today was done so by baking cookies, mostly chocolate. I thought I would make my husband happy and revisit the homemade Oreos I made him for his 30th birthday. But I decided I try a number of different fillings for myself. My two favorites ended up being cream cheese frosting and a combo of caramel, peanut butter and Nutella. Do you see a theme lately? I’m slightly obsessed with the caramel, peanut butter and Nutella combo. So much so that I’ve made my husband make me a Cold Stone style sundae with coffee ice cream regularly. It’s pretty amazing. 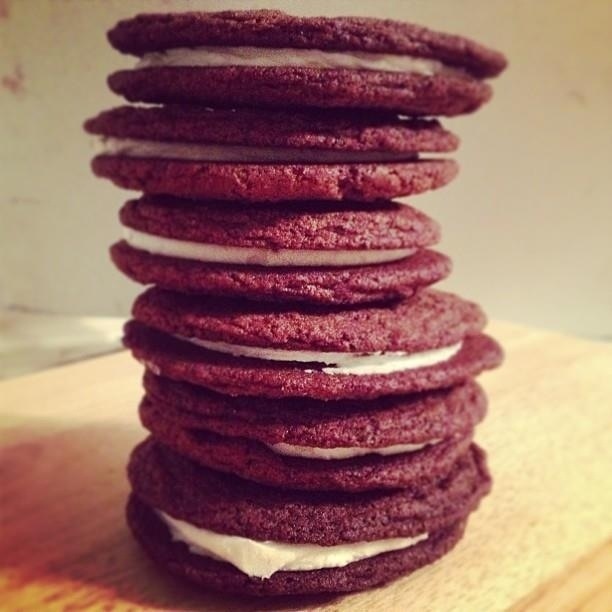 Homemade Oreos are different then store bought. Better. My husband might even agree with me, which says a lot, considering how much this guy loves Oreos. Seriously he will demolish an entire package of Oreos in 24 hours. It’s kind of insane. So in my attempts to get him to be healthy in some way, shape or form, I decided homemade Oreos are the lesser of two evils. Plus I needed to bake off some tension. I highly recommend this recipe. Even if you’re not an Oreo fan, try different filling combinations, and you will be sold on these cookies. They’re a super easy, non fussy cookie which is always a plus. If you can find it, black cocoa powder will give you the signature Oreo color. 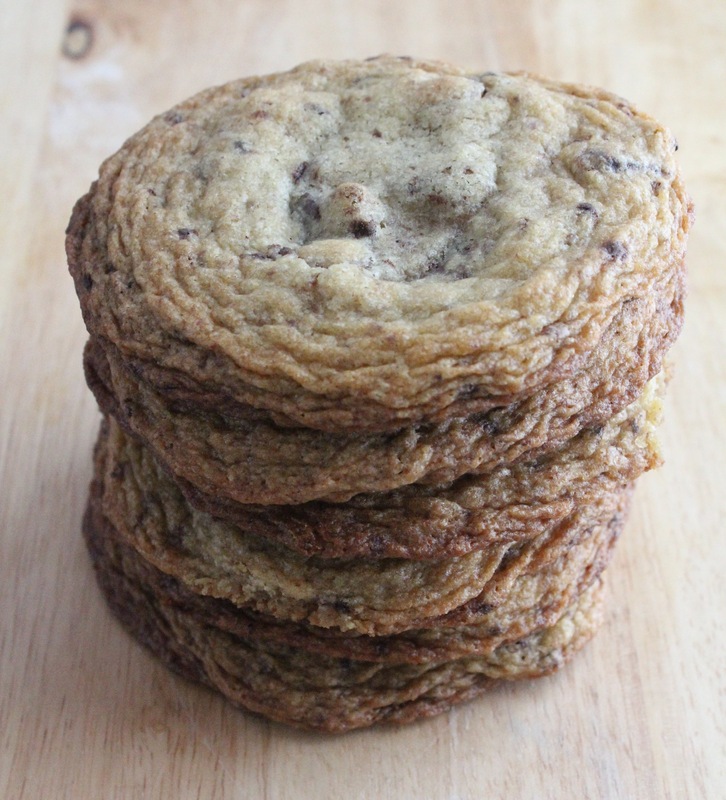 I promise, these cookies are as alluring to a grown up as an Oreo is to a five year old. I have been doing a lot of consoling myself in food and drink lately. You see I have mere days before I start working and I am loosing my mind. My baby cries while I’m gone, hysterically and I end up crying at night worrying about her. 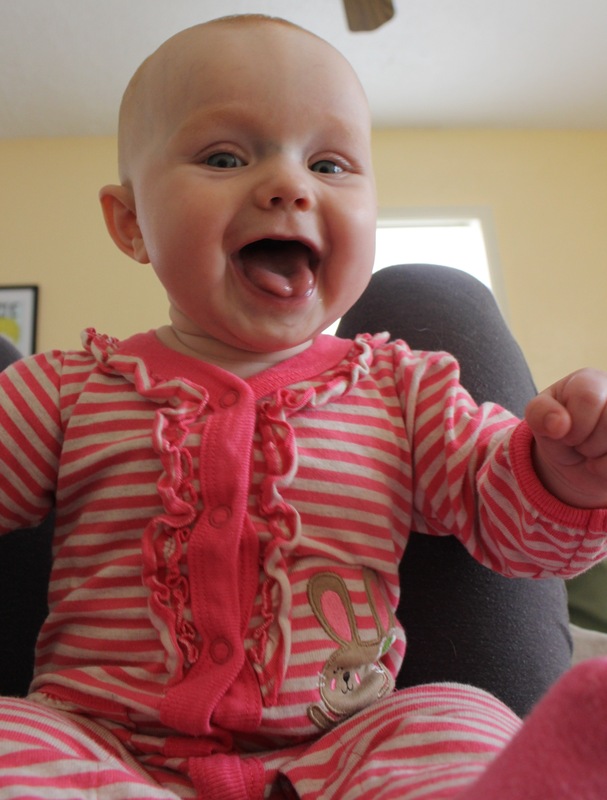 She’s the happiest baby on the planet when it’s just her and I all day. There are never real tears, maybe a fuss here and there when she’s tired, but that’s it. But when I walk out that door it’s a different story. And coming Monday I will be gone for 10 hours. I can’t say it’s a good idea, but if it all goes haywire I will simply quit the job. I can’t stand seeing this child unhappy. I’m just hoping she adjusts quickly, because as if right now she barely even takes a bottle. So at night, once my husband is home and I’m trying to hold it together, I cook. I cook and bake and make a cocktail. I’ve been obsessed with bourbon lately, something that was probably just lying dormant in my DNA all these years. My best stab at distraction so far has been these cookies. I decided to take the Nutella filled chocolate chip cookie and make it 10 times more decadent. I stuffed in peanut butter. And then for good measure, caramel. 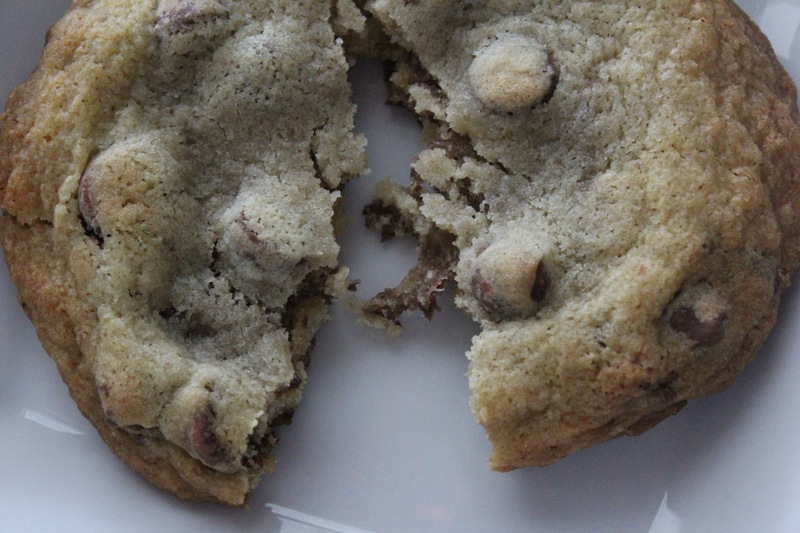 Something fantastic happens when these three meet inside of a chocolate chip cookie. The caramel gets slightly toffee like and the peanut butter and Nutella seem to melt together. It’s really quite fabulous. And the perfect way to forget all about your woes for the day. 1. Make your cookie dough. Using a cookie scoop portion out dough on a cookie sheet. Flatten cookies as much as possible. Place caramel on cookie and top with a teaspoon of Nutella and peanut butter. Take another cookie and cover completely, sealing edges. 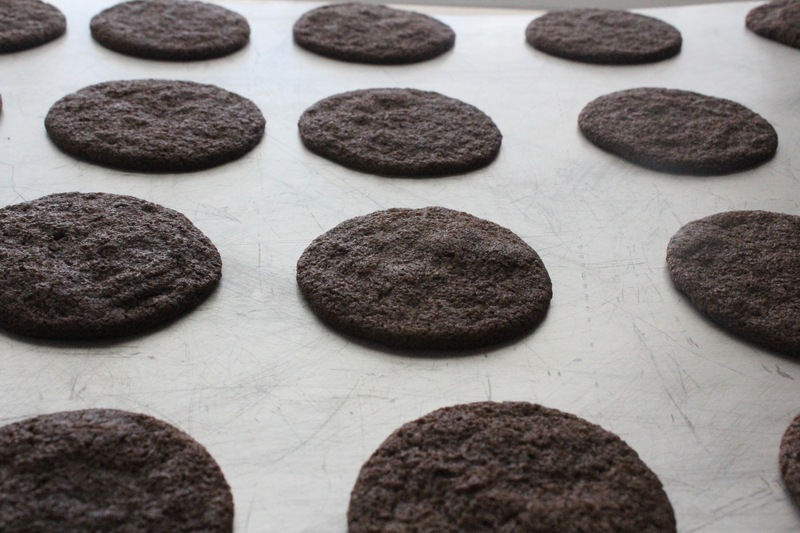 Place on a baking sheet allowing ample room as cookies will be large and spread. Bake for approximately 9 minutes until edges are golden brown and center is just barely set. Allow to cool on cookie sheet before moving.